Jaws is a perfect movie poster in that it tells you everything you need to know about the movie in one simple sheet: a terrifying killer shark is gobbling up beach-goers. You can easily make that assumption from the poster, and when you saw the movie your expectations would be met and exceeded. But not all posters are like that. There are many, many, many posters that are vague and downright confusing, and if you didn’t know anything else about the movie other than what you saw on the poster you might expect something completely different than what the movie actually turns out to be. This column spotlights those posters, and theorizes what the movies could be about based on what the artists give us. A wacky comedy where the lowly caddies get into crazy shenanigans, and the snobbish members won’t stand for it! Rodney Dangerfield plays Rodney Dangerfield and Bill Murray plays your dad. It’s pretty close, but probably the real thing. 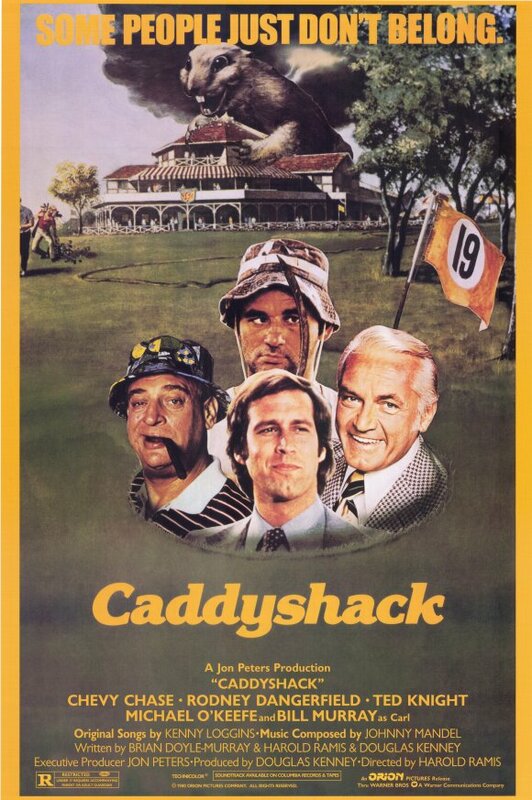 Caddyshack is one of the best comedies of all time, and while a campy horror film about a killer giant gopher starring Rodney Dangerfield and Bill Murray would have been pretty awesome, there was a flood of similar movies around that time such as Night of the Lepus, Frogs and Day of the Animals. Pasting pictures of the four main characters together in the hole looks worse than Hulk Hogan’s current hairline, and it’s obvious that Chevy Chase couldn’t be bothered to do a publicity shoot. And the rest of the poster is hand-drawn, so they probably should have went the Drew Struzan route and drawn the main characters, as well. I’m totally hooked on reading all the old posts. I try to read one every lunch break. I think I might be addicted to trying not to laugh uproariously out loud at work because of how funny you guys are. That’s the sweetest thing I’ve ever heard. Our site has matched up dozens of regional singles. You win Reader of the Month! If we made t-shirts, we’d send you one! That’s so rad, thanks! I never win anything. I graciously accept the honour and prestige that come with this award. You’ll be asked to do a LOT of public speaking in front of hostile crowds. But FREE BEER. lol, is it free because it’s being thrown at me? Along with heads of lettuce and tomatoes I assume. Can’t have a hostile crowd without em!